Now YOU get to determine who receives our funding! If you, or your team, raises at least $5,000 we will donate 75% of your funds to the charity of your choice. Any US-registered breast cancer nonprofit in good standing is eligible. If you have at least 5k in your personal fundraising account on October 1, we will donate 75% of your funds to the charity of your choice. You can choose up to two charities and tell us how to divide your donation between them. The remaining 25% will be donated to Carolina Cups, our sister nonprofit. If your personal fundraising page does not meet the 5k but you are part of a team that meets this minimum threshold by October 1, we will ask the team captain to name the charities and distribution levels (so you may want to talk to your captains in advance to find out what he/she is fundraising for). Seventy-five percent of the team’s total fundraising efforts will go to the one or two charities of your captain’s choosing. The remaining 25% will be donated to Carolina Cups. Check out all the other cool prizes you’ll win, too! And yup, you (as an individual) will also score one flamingo in our Flocks of Love display for every $100 that you raise. If you hit the 5k mark, we’ll also ship you (or the team captain if it is a team effort) 50 birds so you can create your own flock at home! 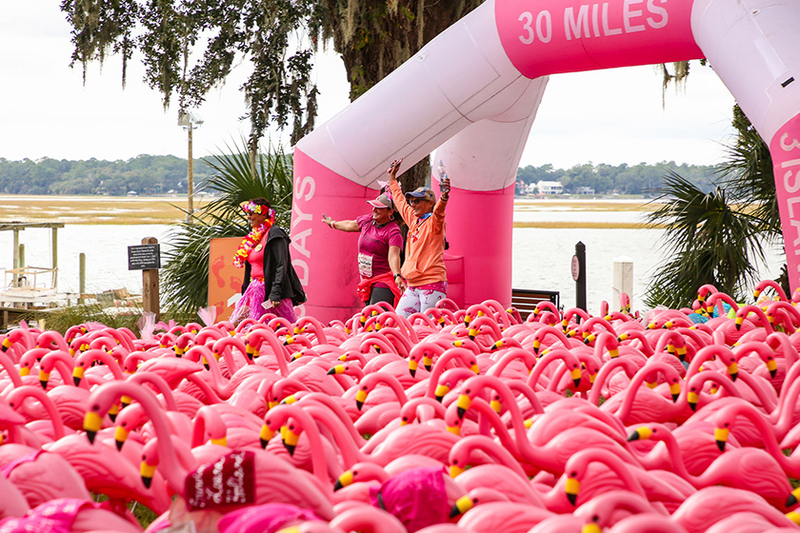 Give them to your donors, set up a flamingo display at the office, start a flocking service to get more donations. The mission of Carolina Cups is to provide breast cancer screening, treatment, and research; as such, all funds must be designated for one of these activities. Specifically, our focus is funding mammograms, biopsies, clinic trials, research labs, and diagnostic equipment. Because we must provide financial accountability for every dime we donate, please understand that we cannot provide direct financial assistance or care packages to patients or families. 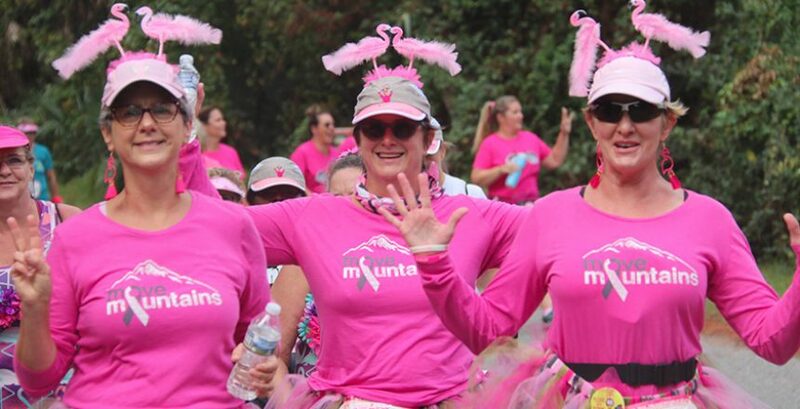 Carolina Cups will only distribute funds to US-registered breast cancer nonprofits in good standing. The charity can be located outside of the US, as long as it is registered with the IRS. Good standing is defined as having a Charity Navigator rating of at least 50% and it must be up to date with all its charitable filings. If you and/or your team are pursuing the Choose Your Charity fundraising milestone, you can submit up to two charities to support. You’ll declare the charity(s) in your dashboard, along with their Tax ID Number and website address. Carolina Cups will review all of the declared charities and if they have any concerns about a particular entity, they will contact you (or the team captain) to resolve. In the unlikely situation that Carolina Cups does not believe the charity qualifies, all parties will know this well in advance, giving you plenty of time to select another charity. Does the $5K need to be raised by an individual or do team totals count? If an individual raises 5k on their own but happens to be part of a team, the individual will determine where his/her 5k gets distributed. The team captain will determine where the rest of the team’s money goes. For example, Mary is part of Team Yay. The team raises 7k, but Mary raised 5k of that. Mary dictates where her 5k goes (minus the 25% that stays with Carolina Cups), and then the team captain determines where the 75% of rest of the 2k goes. If Mary happens to be the captain, she still has to listen to the wishes of her team in determining where the 2k gets distributed, but as team captain, we listen to her. If Mary raises 2k and her team’s total is 7k, then the team captain will tell us where all 7k should go (minus the 25% that goes to Carolina Cups). If Mary isn’t on a team but she raises 4k, then she can either join a team before the Sept 30 deadline to help a team hit the 5k mark (the team captain will determine where funds go) or she can not worry about all that and just feel really good about the fact that she kicked but and all her money is going to help people. And that she’s won a bunch of cool prizes, including free registration for 2020! How many organizations can I choose? Does my organization have to be approved? Yes, the board of Carolina Cups is legally required to donate its funds only to breast cancer nonprofits. They will do their own due diligence to ensure that your charity is in good standing and meets their criteria. When you tell us what charities you want your fundraising to go to, Carolina Cups will review your designations and let you know as soon as possible if there are any concerns. What is the criteria for the organization? The nonprofits must provide breast care/research, they must be in good standing with the IRS and their state, and they must have a Guidestar rating of at least 50%. Any entity that does not meet these minimum standards will be reviewed on individual merit and the Carolina Cups board will make final decision. When can I submit my charity? When will my charity receive the funds? The fundraising deadline for this program is September 30. It takes about a month to finalize due diligence and prepare necessary paperwork, so the goal is to distribute the funds sometime between Nov 1 and Nov 15.